Have you learned from SpongeBob movie, I was not only deeply love with this movie, but in addition to seeing the film I also examined the benefits of the SpongeBob movie. 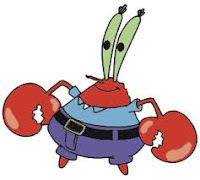 yes, .. sir Krabs is a leader of a small company that he runs well and discipline. shop restaurant named as the Krusty Krab restaurant is the best selling among other restaurants that are in this movie. competition even tighter than host Krabs named Sheldon Plankton, the owner of the Chum Bucket was not able to beat the master Krabs. So what are the benefits that can be a lesson of character Mr. Krabs? for me that should be a lesson and a science of character Mr. Krabs is a good management in managing the restaurant has. apart from that discipline and the rules that apply to all members of the restaurant owned by Mr. Krabs is quite tight. Mr. Krabs really distinguish between a business with friends or relatives, business is business and friends remain friends. besides, how else bestselling Krusty Krab with loyal customers keep coming every day, and the flavors of the restaurant Krusty Krab has not changed at all. So what we should avoid from the character Mr. Krabs in SpongeBob movie? Eugene H. Krabs is a crab Krusty Krab restaurant owner who is obsessed with money. Because since he was too fond of money, to the extent that he was not willing to give any money. 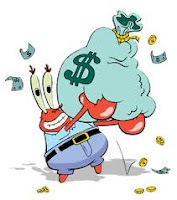 General description of Mr. Krab is a greedy and stingy crab and Spongebob are often the victims of greed.